Founded by NDT industry legends Chuck Hellier and Jim Treat, NDT Classroom is the pioneer in online NDT training. 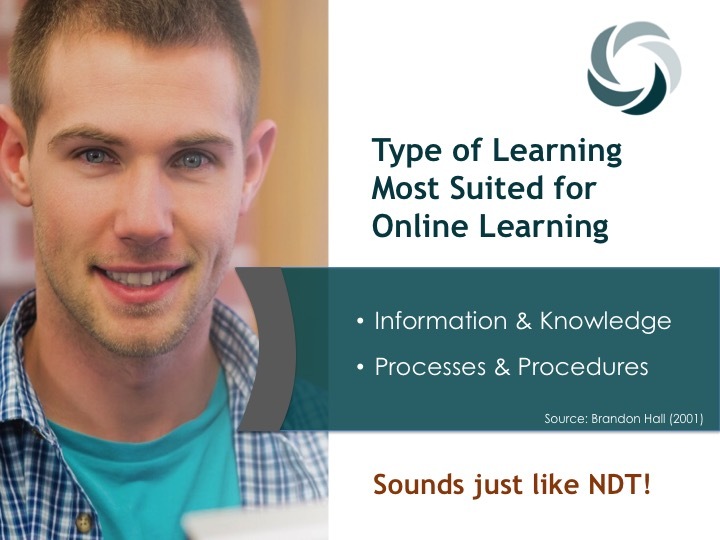 In partnership with Full Circle Studios and Dr. Kevin Crosby (PhD in Curriculum and Educational System Design), Chuck and Jim set out to create an affordable, accessible, consistent and effective online NDT training program that works. NDT Classroom was the result. Led by top industry experts in their field, NDT Classroom courses feature state-of-the-art HD training videos, meet industry practices (SNT-TC-1A, ANSI/ASNT CP 189, NAS 410, ISO 9712, NDT AWS-CWI (NDT portion), and cover the body of knowledge in ANSI/ASNT CP 105).Our dynamic content engages learners and ensures an exceptional online training experience that works - for students, for employers, and for educational institutions. NDT Classroom courses feature engaging, interactive HD-video-based training designed to create a classroom-like environment with an instructor. Our videos provide clear, close-up video demonstra­tions of the subject material and make frequent use of formative evaluation techniques that require learners to respond and demonstrate their knowledge and understanding as they progress through a course. This ensures that misunderstandings or misinterpretations can be detected and corrected quickly. We’ve coupled the benefits of video with the ability to interact with the instructor directly through email. Students can ask questions to real people and get real responses. It’s the next best thing to going through the coursework in person with the instructor by your side, and at a fraction of the cost.